So we turned into Barney Kiernan’s and there, sure enough, was the citizen up in the corner having a great confab with himself and that bloody mangy mongrel, Garryowen, and he waiting for what the sky would drop in the way of drink. —There he is, says I, in his gloryhole, with his cruiskeen lawn and his load of papers, working for the cause. The bloody mongrel let a grouse out of him would give you the creeps. Be a corporal work of mercy if someone would take the life of that bloody dog. I’m told for a fact he ate a good part of the breeches off a constabulary man in Santry that came round one time with a blue paper about a licence. —I think the markets are on a rise, says he, sliding his hand down his fork. —Arrah, give over your bloody codding, Joe, says I. I’ve a thirst on me I wouldn’t sell for half a crown. —Three pints, Terry, says Joe. And how’s the old heart, citizen? says he. The Cyclops episode of Ulysses is full of vitriol and humour. Most of the episode takes place in Barney Kiernan’s pub in Little Britain Street. The pub is no longer in use and whilst other public houses such as Davy Byrne’s in Duke Street celebrate and manipulate their Joycean heritage, others have quietly disappeared. Burgess notes the glorifying of pubs and poverty, and in this regard Barney Kiernan’s is the most interesting of the public houses of Ulysses. Joyce’s purpose in life was to glorify the Dublin of pubs and poverty, not to further a shining national image. He was a Dubliner as Bloom and Earwicker are Dubliners, and both Bloom and Earwicker are foreigners. This pub is still going strong in Little Britain Street, but its great days were from fifty to a hundred years ago. Yet it still stands as it was then, non-party market scales hanging from smoked rafters, cobwebs and all complete. Time was when Dan O’Connell and his contemporaries dropped in from the courthouse for a drink, and later on the Earl of Dudley, the popular Viceroy was an occasional guest, but now, so the genial proprietor assures me, the art of and the taste for conversation (an art developed in the tavern through centuries to perfection) have been vanquished by the cinema, the football field and the puritan licensing laws. It is interesting to note that it was Joyce who introduced Ireland’s first commercial cinema the Cinematograph Volta nearby at 45 Mary Street in 1909. Joyce’s books are about Dublin, all of them. In the earlier sections of A Portrait we visit other Irish places, but briefly. We home back to Dublin with relief. But we are wrong if we think that Dublin encloses the work of Joyce, that a knowledge of the city is the key to understanding. The living Dubliner claims a superior appreciation of Joyce because he knows the distance from Sir John Rogerson’s Quay to Mount Jerome Cemetery. This is a delusion. Dublin, in Joyce, is turned into an archetypal city, eventually into a dream city. Moreover, the Dublin of 1904 is, with romantic Ireland and O’Leary, dead and gone. Davy Byrne’s is now a smart bar, not a boozer. The Martello Tower is a Joyce museum, an omphalos of petrifaction. 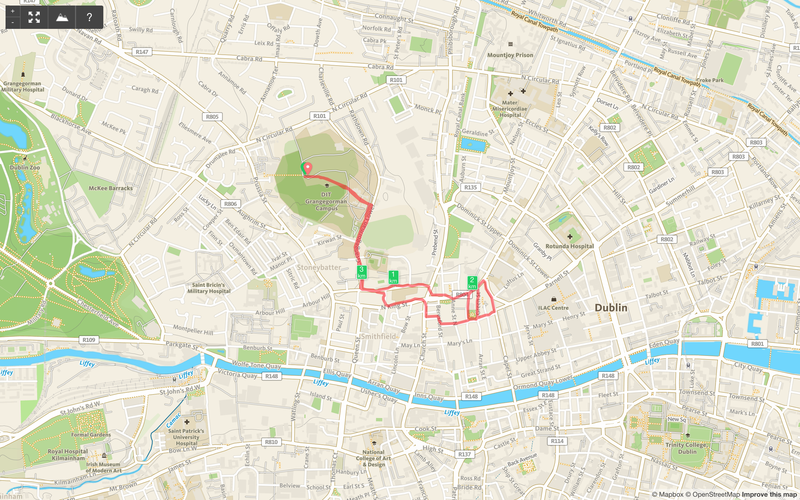 It helps us to know something about Dublin, the real city of Joyce’s memory, when we tackle the myths he has made of it, but it is by no means essential. The real keys to an understanding of Joyce are given to the diligent reader, not the purchaser of an Aer Lingus ticket. Don’t beat me, pa! And I’ll…I’ll say a Hail Mary for you. A very sullenfaced man stood at the corner of O’Connell Bridge waiting for the little Sandymount tram to take him home. He was full of smouldering anger and revengefulness. He felt humiliated and discontented: he did not even feel drunk and he had only twopence in his pocket. He cursed everything. He had done for himself in the office, pawned his watch, spent all his money; and he had not even got drunk. He began to feel thirsty again and he longed to be back again in the hot reeking publichouse. He had lost his reputation as a strong man, having been defeated twice by a mere boy. His heart swelled with fury and, when he thought of the woman in the big hat who had brushed against him and said Pardon! his fury nearly choked him. This grim story from Dubliners focuses on the mean character of Farrington. The story involves an unhappy work and home life, drink, poverty, the pawn shop, and bullying. It also introduces Nosey Flynn in his regular haunt of Davy Byrne’s public house, and they both reappear with the much more congenial Leopold Bloom in Ulysses. Joyce finished Counterparts, the sixth story of Dubliners in July 1905 and wrote to his brother Stanislaus on the 19th July 1905, Many of the frigidities of The Boarding House and Counterparts were written while the sweat streamed down my face on to the handkerchief which protected my collar. (Ellmann, Selected Letters of James Joyce, Pages 63 and 69). The difficulties Joyce experienced with the heat may have influenced the hopelessness if the story. The story ends in Shelbourne Road, where, according to Vivien Igoe, Joyce resided from late March 1904 to 31 August 1904. (James Joyce’s Dublin Houses, pages 97, 124). You can see the house at 60 Shelbourne Road in Google Street View by clicking here. If you rotate the view you can see the wall of Beggars Bush Barracks across the road from the house that Farrington walks alongside in Counterparts. It would seem reasonable that the home referred to in the story is the house at 60 Shelbourne Road, except that none of the houses in the terrace has a side door. Joyce left the family home at St. Peter’s Terrace to move south to Shelbourne Road. I ran the route of the trams that went between these locations. You can see the 1910 Dublin United Tramways Company timetable on the National Archives of Ireland website here. You can browse the routes and you can read the various schedules and fares. 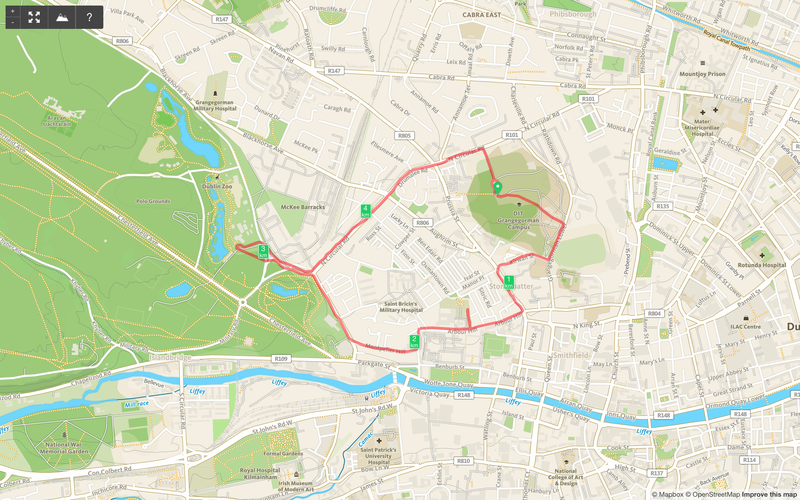 I ran along the Donnybrook and Phoenix (N.C. Road) Line from the North Circular Road to Nelson’s Pillar, now the location of The Spire of Dublin. 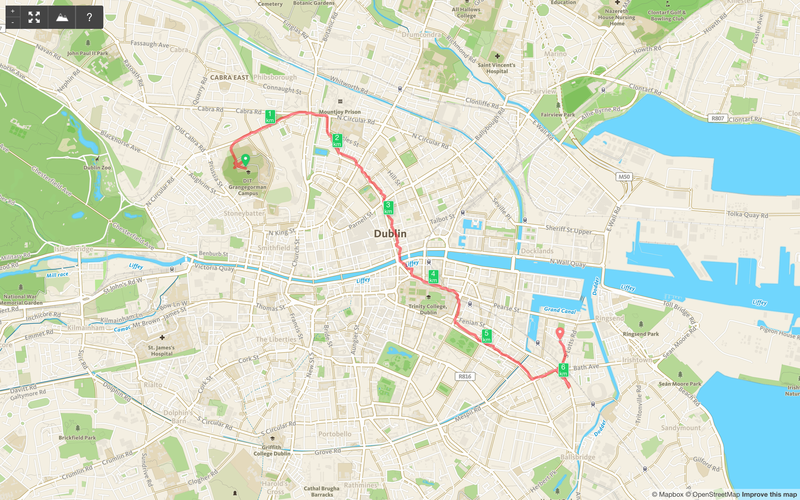 I continued along the route of the Nelson Pillar to Sandymount tram. 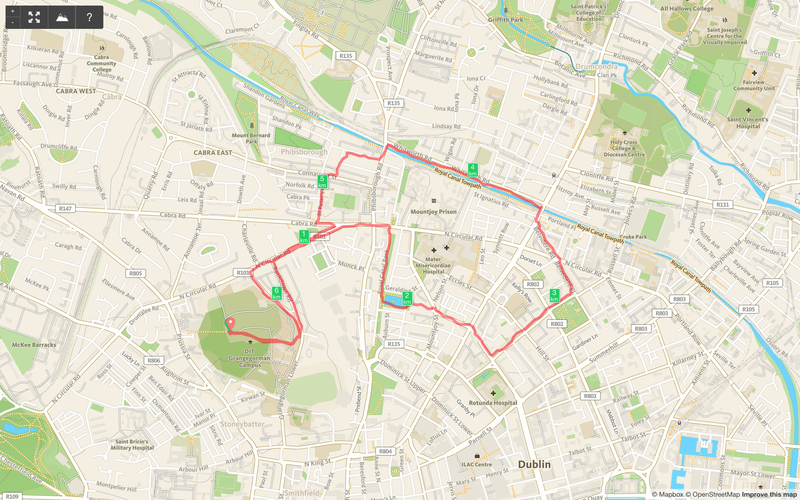 I ran the original Horse Drawn Tram route which, according to Michael Corcoran began in 1872 and ran via Westmoreland Street and Great Brunswick Street, now Pearse Street. In 1901 the route was electrified and ran via Nassau Street and Westmoreland Street. (Through Streets Broad and Narrow, A History of Dublin Trams, page 140). Farrington’s real life counterpart may have been William Murray, Joyce’s uncle. William Murray lived at 16 Shelbourne Road. These houses, built in the Piano Nobile style have a side-door at the front, underneath the staircase to the main entrance to the house on the first floor. This layout matches the description of the house in the text. These are the same words that end the bleak story, Counterparts. Pritchard, D. (2001) James Joyce. New Lanark, United Kingdom: Geddes & Grosset. This triviality made him think of collecting many such moments together in a book of epiphanies. By an epiphany he meant a sudden spiritual manifestation, whether in the vulgarity of speech or of gesture or in a memorable phrase of the mind itself. He believed that it was for the man of letters to record these epiphanies with extreme care. seeing that they themselves are the most delicate and evanescent of moments. In his book Re Joyce Anthony Burgess writes of the significance of dates to Joyce. I start this book on January 13th, 1964 – The Twenty-Third anniversary of the death of James Joyce. I can think of no other writer who would bewitch me into making the beginning of a spell of hard work into a kind of joyful ritual, but the solemnisation of dates came naturally to Joyce and it infects his admirers. Indeed, this deadest time of the year (the Christmas decorations burnt a week ago, the children back at school, the snow came too late to be festive) is brightened by being a sort of Joyce season. It is a season beginning in Advent and ending at Candelmas. January 6th is the Feast of the Epiphany, and the discovery of epiphanies – ‘showings forth’ – of beauty and truth in the squalid and commonplace was Joyce’s vocation. February 1st is St. Brigid’s Day. February 2nd is Joyce’s birthday, and two massive birthday presents were the first printed copies of Ulysses and Finnegans Wake. Some hold the view that The Dead is set on the Feast of the Epiphany. There is some logic to this as the dinner clearly takes place after Christmas. Greta and Gabriel Conroy are staying away for a night without their children, which would presumably not happen on Christmas night and the following passage reveals that the Christmas period is at an end. —Browne is out there, Aunt Kate, said Mary Jane. —Browne is everywhere, said Aunt Kate, lowering her voice. —Really, she said archly, he is very attentive. —He has been laid on here like the gas, said Aunt Kate in the same tone, all during the Christmas. The Dead centres on Gabriel’s epiphany. Early in the story he is reluctant to visit Galway, in the West of Ireland. Later in the story, back in the Gresham Hotel, Gabriel reflects on what he learnt of Michael Furey and Greta’s past. He has resolved to head West. The story closes with snow falling all over Ireland. Ironically my run on 6th January 2015 took place on a mild and bright sunny day.